format : Carboard sleeve sampler CD limited to 500 copies, for promotional use only. 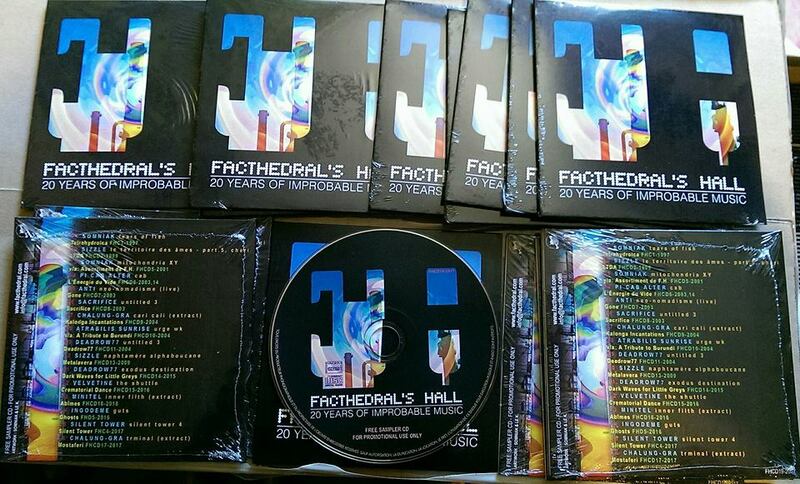 details : For celebrate the 20th anniversary of Facthedral’s Hall, we have edited this compilation which contains tracks from our past catalogue (1997 to 2017). Some of them have been remastered. CD exclusively reserved for promotional use, and offered with any order on the F.H. mailorder. Comes in cardboard sleeve. Artwork by SomniaK & Le K.
v/a: "Facthedral's Hall, 20 Years of Improbable Music"
Free F.H. CD sampler in cardboard sleeve. Exclusively offered with any order on the shop. Simply add to cart one CD with your order.